Like snowflakes, I love leaves - each one is different from the next. I hand cut and forged this leaf from solid sterling silver sheet. I love this organic shape with its folds and textures throughout. I wanted additional texture on the bail, so I added a coil of sterling wire. 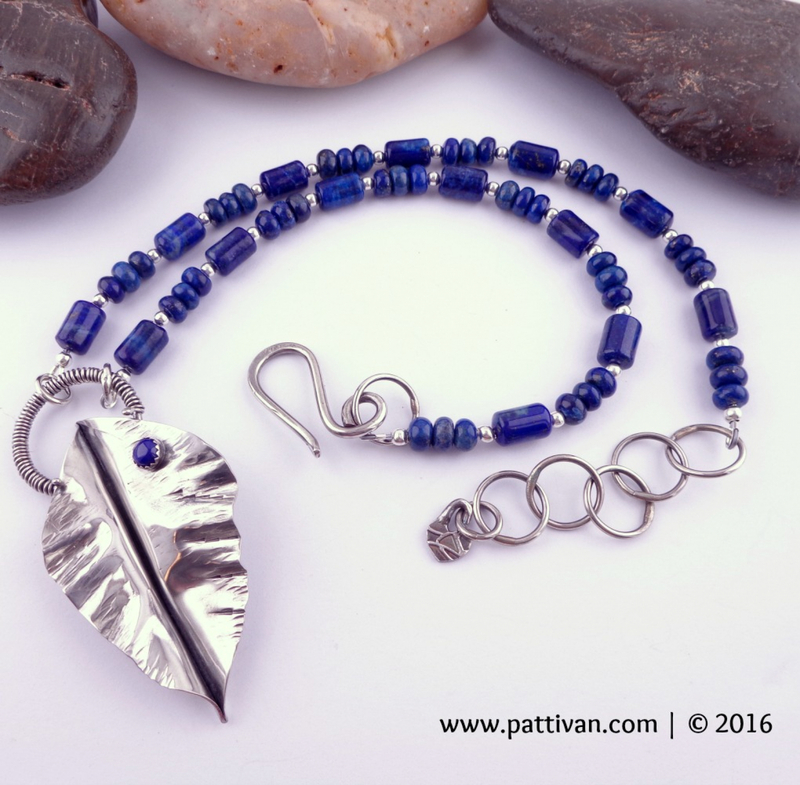 A tiny, 5mm lapis lazuli cabochon - bezeled in sterling - has been added to the focal. I have had these stunning lapis lazuli gemstones - rounds and tubes - in my stash for quite a while, waiting for the perfect necklace. Studded with additional sterling silver rounds, the necklace includes a 2" extender chain, formed from soldered links. I made a tiny heart charm from sterling silver PMC (precious metal chain), and attached it to the last loop. The necklace fastens with a simple clasp, forged from heavy sterling silver. The complete pendant measures 2 3/4" length, including the bail, and 1 3/8" in width at its widest point. The necklace is adjustable and measures just over 20" in length, including the 2" extender chain. All metals used in this design are .925 sterling silver. NOTE: 100% of the proceeds from the sale of these earrings will be donated to Miracle Horse Rescue, a 501(c)3 Non-Profit Organization. From the bottom of my heart, thank you for helping me help those who cannot help themselves!